In the currently favored ΛCDM cosmological model, the growth of galaxies at low and intermediate redshift must occur primarily via collisions between galaxies. This fact has been used to explain a number of observations of distant galaxies, in particular the existence of active galactic nuclei (AGN). The argument goes that collisions between galaxies torques the atomic gas in the outskirts of the galaxies, causing the gas to flow in toward the center, providing fuel for central starbursts and AGN outbursts. This theoretical explanation has been backed up by extensive simulations of galaxy mergers. However, if we take the simulations at face value, we are left with a problem. The simulations predict that in the stage between the initial collision between equal-mass galaxies and their final coalescence, there should be a high probability of seeing both galaxies as quasars. While there are many examples of AGN pairs with relatively large separations, there are (including the object discussed in this paper) currently only six known closely separated pairs. Unless there are many more undiscovered closely separated AGN pairs, something must be seriously wrong with our theoretical understanding of galaxy mergers and black hole growth. Left: A Keck NIRC2 laser guide star adaptive optics image of the dual AGN SDSS. Right: the same galaxy as imaged by OSIRIS, showing that OSIRIS is capable of spatially separating the two objects. This brings up an interesting question. Observationally, how exactly can one tell that a pair of galaxies is indeed a dual AGN? 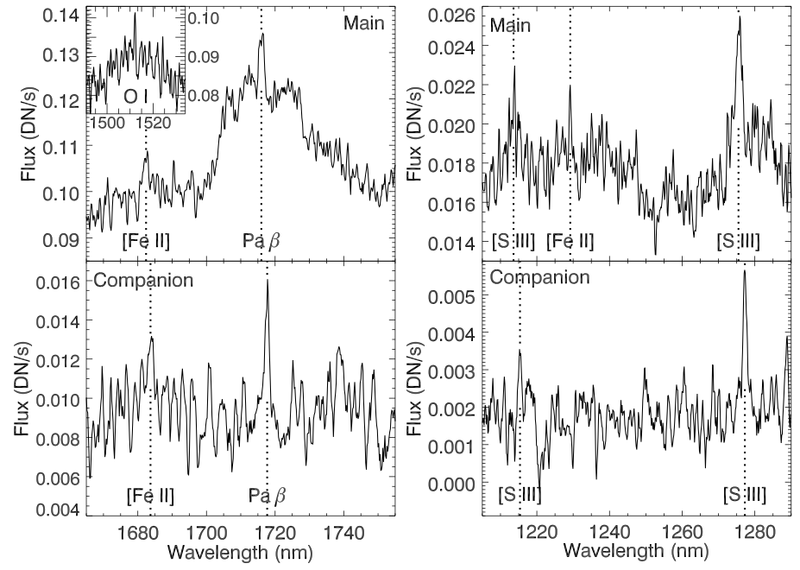 For example, one could look in large catalogues of galaxy spectra (e.g. the SDSS) for objects with dual sets of high excitation emission lines with modest velocity offsets. These objects may be dual AGN, but may also be a chance superposition, a signature of an outflow emanating from a single AGN, or be due to an AGN surrounded by an ongoing central starburst. One could also perform imaging of objects known to host double-peaked emission lines and look for objects with distinct but closely separated cores of emission. Unfortunately, this doesn’t confirm an object as a dual AGN, and can only be used to rule objects out. What is really needed is spatially resolved spectroscopy, e.g. with an Integral Field Unit (IFU). An IFU observation yields a a position-position-velocity data cube, that is, an image of the sky with a corresponding spectrum at each pixel. One can then combine both of the methods discussed above: an AGN with double, offset emission lines can be spatially resolved into two clumps of emission and that can then be individually inspected to pick out the AGN lines emitted by each source. The authors of this paper have obtained observations of the SDSS quasar J0952+2552 with OSIRIS, an IFU on the Keck 2 telescope. Taking advantage of laser guide star adaptive optics, they are able to obtain extremely high spatial resolution imaging and spectroscopy to uniquely and beautifully confirm this object as a dual AGN. 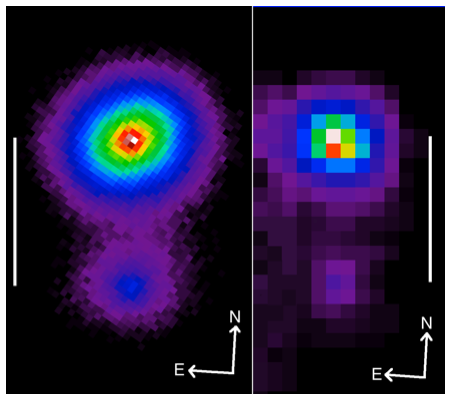 In the image to the left, the authors compare both the broadband near IR adaptive optics imaging with the OSIRIS IFU observations. Clearly, the IFU observes at lower spatial resolution, however, it is also clearly able to separate two blobs of emission, corresponding to two distinct galaxies at z = 0.34. The emission line spectrum of the two sources as observed by OSIRIS. At top, the primary source shows both broad and narrow emission lines. At bottom, the companion galaxy shows only narrow emission lines. When comparing the spectra of the central regions of both galaxies, reproduced at right, the authors find that both galaxies host distinct AGN. 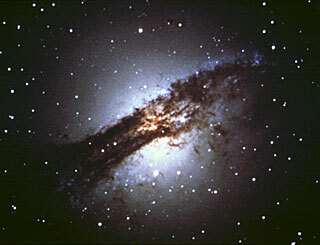 The primary galaxy is a Type 1 Seyfert galaxy, showing both broad and narrow emission lines, while the companion is a Type 2 Seyfert, showing only weaker narrow emission lines. Since the companion only shows narrow lines, it is possible that the emission emanates from star forming regions in a nuclear starburst rather than in the region near an AGN. Since AGN and young stars have very different ionizing spectra – AGN emit more of their ionizing radiation as X-rays and in the extreme ultraviolet than young stars – one can use the ratio of the flux in certain emission lines of nitrogen, hydrogen, and oxygen to determine whether the ionization is due primarily to a starburst or due to an AGN, a so-called BPT analysis. 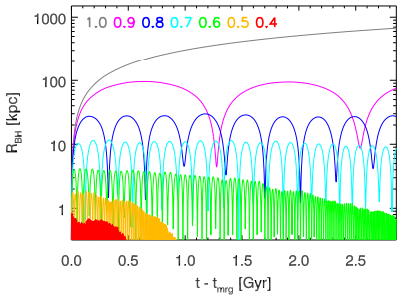 While the authors cannot perform a full BPT analysis, they can measure one of the line ratios that goes into the analysis, and luckily can conclusively rule out star formation as the cause of the ionization. These observations required some of the most cutting edge techniques in observational astronomy. By leveraging new observing technologies, they have expanded the dual AGN sample by 20 percent! More observations like those described here will further expand the sample and allow theorists to pin down the physical mechanisms at work when two galaxies collide.